X-rays were discovered in 1895 by Wilhelm Conrad Röentgen, a professor at Würzburg University in Germany. Experiments showed that these electro-magnetic rays could penetrate soft tissues but not bones. This speciality of X-rays has been particularly useful as a diagnostic tool. Medical imaging helps to detect broken bones. However, some patients do have concerns about radiation exposure and the safety of X-rays. Read below for an article on patient-centered radiation safety by Prairie Spine and Pain Institute’s X-ray tech Amy Hudson. “I have been getting a lot of x-rays lately for my condition, am I getting too much radiation”? This is something I hear a lot from patients and according to many researchers, public concern about radiation safety in diagnostic imaging has increased in recent years. 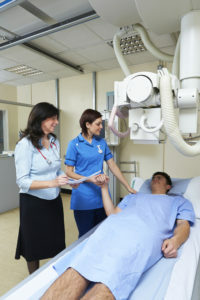 News reports about misuse of medical radiation, scientific findings related to the increased use of computed tomography (CT) and patient misconceptions about the use of radiation in medicine have all contributed to the patient’s perception of radiation safety before he or she even enters the radiology department. Radiation is one of the most exhaustively studied etiologic agents. The survivors of the U.S. nuclear bombings of Hiroshima and Nagasaki, Japan are the most thoroughly studied population exposed to radiation and that data continues to be collected. There are also comprehensive studies of occupationally exposed medical personnel that are ongoing. Despite the research related to radiation risk to the public and healthcare professionals, studies and information related to the patient’s perception are scarce. Historically, there has been a wide gap between public understanding of ionizing radiation and the knowledge researchers and medical personnel have. Medical radiation use has evolved to play an essential role in diagnosis and treatment of a wide variety of pathologies, reducing costs, morbidity and mortality while simultaneously improving patient outcomes. Misinformation can lead to unnecessary fears and serve as an obstacle to a patient consenting to a radiographic exam, which in turn could further jeopardize the patient’s diagnosis, health and ultimately their life in certain instances. A healthy patient – centered radiation safety culture must be founded on an understanding of the benefits and risks of medical imaging. 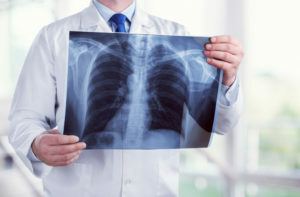 Radiologic technologists and other medical professionals can help by communicating this information to patients and caregivers in an accurate and understandable manner, and by applying safety standards to imaging procedures. If you ever feel like an exam is unwarranted or unnecessary, do not hesitate to ask your provider to explain. Medical staff should be aware that patients can have positive and negative thoughts about radiation exposure. The appropriate staff member should be able to inform the patient of the appropriateness, justification, optimization and required acquisition of accurate data for clinical decision making. At Prairie Spine & Pain Institute, we always want to make you feel comfortable and that you are being treated with the most appropriate and beneficial treatments. PreviousPrevious post:Tips for Avoiding Back PainNextNext post:Urgent: Time is Running Out… VOTE NOW!